This photo of the Clipstone Colliery Cricket Team appeared in the Chad in 1966. Does anyone recognise any of the players? I am delighted to see the photo and the recognition of John Curtis and his leadership in 1966. I played in this team that won the Bassetlaw League Championship. 2016 is the 50th anniversary of this great performance. Is the club intending to celebrate this milestone in its history. If so I would like to attend. could you please let me know. I would also be pleased to make contact with John and come to spectate at a home fixture. Many thanks and good luck to you for 2016. I was Captain of this cricket team which won the Bassetlaw League Championship . Back row ; R Elvidge [Secretary] , K Thicket, K Wilkinson, C Ward, T P Preistley, J Howarth , G Elvidge [Scorer] . 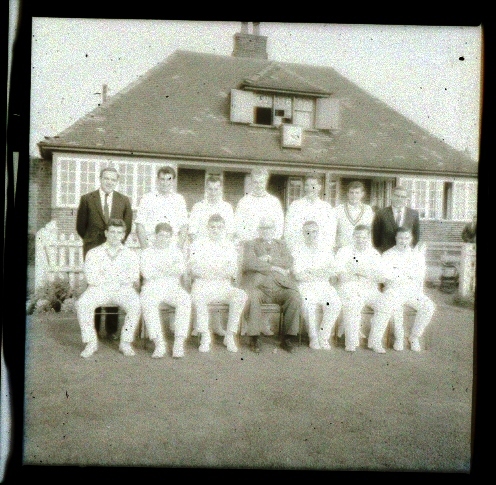 Front row ; F Barker, T Hayes, g Quiable, G Boffey[Chairman], J Curtis[Captain], J Goodwin, M Revill .